So….in case you haven’t noticed I’ve been out of the action for a little bit. The other day I took a pretty nasty spill on my bike. I was riding next to water flowing down the gutter and got too close. 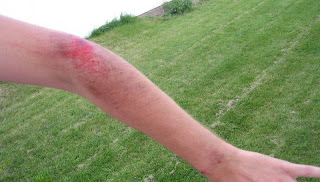 I’ve ridden in the stream of water before and had no trouble, but for some reason that day my bike completely slipped out from under me and chucked me to the ground where I slid across the loose gravel. I didn’t break any bones or get any stitches–just some nasty scrapes. The worst part, though, was taking a shower afterward–trying to scrub out all the dirt. Then pouring hydrogen peroxide all over my fresh wounds and feeling the sting as it bubbled over. Putting on hockey pads sucked for awhile because they kept rubbing against my scabs that were trying to heal. I’m good now though, played a game of street hockey on Saturday. The weather was perfect and we had a couple new guys show up and they tore it up. Healthy competition is always fun. This entry was posted on on September 12, 2010 at on September 12, 2010 and is filed under Uncategorized. You can follow any responses to this entry through the RSS 2.0 feed. You can leave a response, or trackback from your own site.